Each session is scheduled to last up to 50 minutes. A writer can make 3 appointments per week but cannot schedule them back-to-back. Because we want as many students to have the opportunity to work with a consultant, we encourage you to please cancel your appointment (or contact us) as soon as you know you will be unable to attend the appointment so that the time can be available to another student. We take drop-ins if another writer misses an appointment, if an appointment ends early, or if there is not an appointment scheduled during a given time period. Only students (graduate, undergraduate, or special) enrolled in courses at UW Oshkosh can use the Writing Center. Instructors will be notified of an appointment at the writer’s request. Disrespectful or abusive behavior by either consultants or writers will not be tolerated. All questions or concerns should be directed to Dr. Crystal Mueller, Writing Center director. 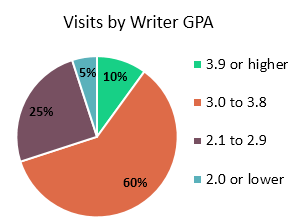 Pie Chart: About 10% of the writers we see have a GPA of 3.9 or higher, 60% have a GPA of 3.0 or higher, 25% have 2.1-2.9 and 5% had a GPA below 2.0. Please bring a copy of your draft (if you have one) and your assignment directions. If you prefer working with a printed copy of your draft in front of you, you should bring that. If you prefer working on your laptop and making revisions to your draft right away, you should bring that. Additionally, bring any notes or sources that are key to what you want to discuss about your writing. What can consultants help me do? Consultants can help you . . .